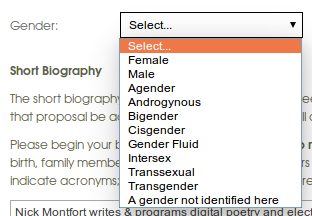 The AWP (Association of Writers & Writing Programs) offers you eleven options on their Web form for indicating your gender. But these are listed in a drop-down box, so you can’t choose more than one. The Electronic Literature Organization is delighted to announce two awards to be given this summer; nominations are open now. >Literature.” Below is information including guidelines for submissions for each. >welcome. Membership in the Electronic Literature Organization is not required. >work that he or she wishes to be juried. >within 18 months, no earlier than December 2012. >a professional bio and a headshot or avatar. >materials will be returned via a self-addressed mailer. >acknowledged on the award webpage. >will be mailed to the winner. >in the Electronic Literature Organization at the Associate Level. >winner from among the finalists. >of non-web work, available via Dropbox or sent as a CD/DVD or flash drive. >will be returned via a self-addressed mailer. Thanks to Golan Levin’s “atypical, anti-disciplinary and inter-institutional” FRSCI lab, the CMU Computer Club, and ROM hacking bit-boy Cory Archangel, several instances of previously unknown visual artwork, done by Andy Warhol on the Amiga 1000 in 1985, have been recovered. Warhol’s use of this classic multimedia system is but one of the many surprising, rich aspects of Amiga history that are carefully detailed by Jimmy Maher in The Future Was Here: The Commodore Amiga. An early topic is the launch of the first Amiga computer at the Lincoln Center, with Andy Warhol and Debbie Harry in attendance and with Warhol producing a portrait of her on the machine during the festivities. 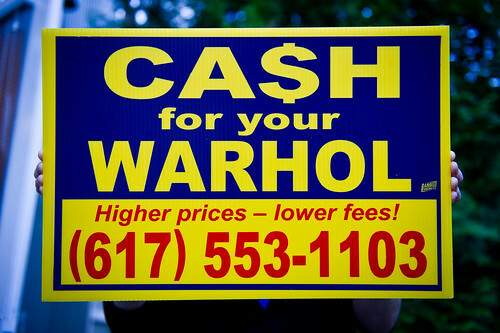 Maher also writes about how Warhol’s attitude toward the computer was actually a bit retrograde in some ways: Rather than thinking of the screen as a first-class medium for visual art, he wanted better printers that could produce work in a more conventional medium. 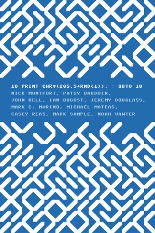 The discussion of Warhol’s involvement is but one chapter (actually, less than one chapter) in a book that covers the Amiga’s hardware development, technical advances, relationship to image editing and video processing work, and lively demos — from the early, famous “Boing Ball” demo to the productions of the demoscene. The Future Was Here is the latest book in the Platform Studies series, which I edit with Ian Bogost. With these images surfacing now, after almost 30 years, the age-old question “soup or art?” is awakened in us once again. Do we need to print these out to enjoy them? To sell them for cash? 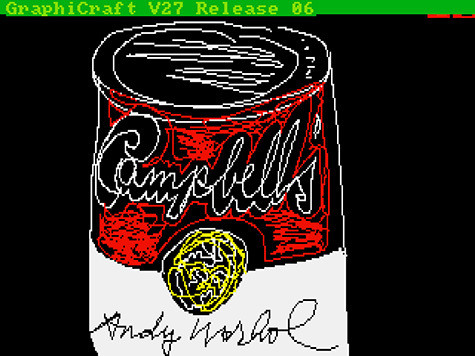 Did Warhol invent what is now thought of as the “MS Paint” style, back on the Amiga 1000 in 1985? Note, finally, that there is a detailed report on the recovery project provided in PDF form. There’s a _remake_ (or maybe a _reboot_?) of superbad.com, the classic, off-kilter, uncanny art website that was employed back in 2008 in a Grand Text Auto April Fool’s joke. Kevin Brooks, a storyteller who worked with technology in many contexts, died last Friday of cancer. Kevin was finishing his PhD at the MIT Media Lab when I was there as a masters student. Although he was farther along in his studies and working on a different floor with Glorianna Davenport’s research group, he helped me with my thinking and became a real friend, discussing his work (from Tired of Giving In to his Agent Stories project for his dissertation, “Metalinear Cinematic Narrative: Theory, Process, and Tool”) and how to develop other sorts of interactive narratives. Kevin also introduced me to the storytelling of Brother Blue and the rest of the Cambridge storytelling community. Kevin was at Apple before coming to MIT and went on to work at Motorola and, later, Hallmark. 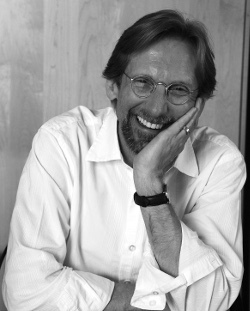 When I came to MIT, I was interested in inquiring about narrative and poetics in the system-building work that I did, and I was lucky to encounter Kevin, who had been looking at the forms and structures of storytelling as well as its ability to treat themes, to change people, and to change the world. There is a very nice profile of Kevin in the MIT News section Technology Review, from 2011. If you felt like you missed your chance to … profit! … from the ascendance of Bitcoin, try the new, shiny Advanced Bitcoin Simulator, an interactive fiction by a sekrit author. It’s built with yui3, Inform 7, and parchment, but also builds on the simulation of online forums found in Judith Pintar’s CosmoServe, incorporates some of the audacity of several recent Twine games, and offers a bit (no pun intended) of the Ayn Rand pillory found in Bioshock.